Whether you are renovating your lawn or building a new yard, you can count on Heroes Lawn and Landscape for all of your landscaper in Papillion needs. We provide services such as landscape care, landscape design, and yard maintenance. Our landscaper in Papillion can create a more attractive outdoor area and build a better environment for you. In addition, having a well-kept yard, courtesy of our landscaper in Papillion, will help increase your property’s value. At Heroes Lawn and Landscape, we understand that as a client, there are qualities that you are looking for in a landscaper in Papillion. Read on to find out what we can bring to the table when you choose us to be your landscaper in Papillion. We consider your style and preference when it comes to design. Our landscaper in Papillion can also provide recommendations on what plants and structure will work for your yard. Our experts will check on soil quality to know what plants to install. 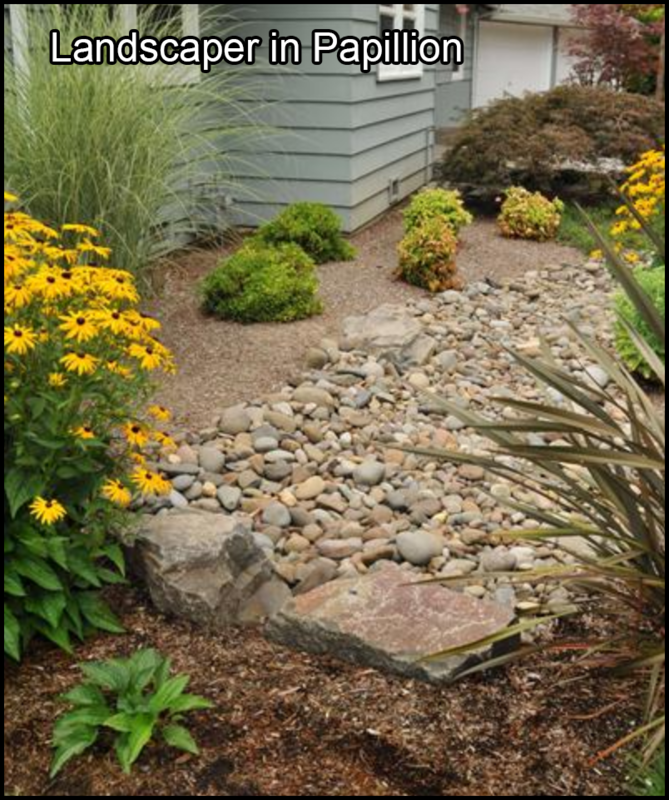 Additionally, our landscaper in Papillion can build patios and retaining walls that will complement your plants. If you don’t have time to manage your yard, leave it to our team. We offer lawn care services including leaf removal and mowing, among others. Building outdoor facilities such as walls and gazebos is not a project you do on your own. These structures may collapse and cause accidents if they are not built well. Our experienced landscaper in Papillion knows the best design for your property. Aside from structural expertise, our landscaper in Papillion is familiar with different zoning laws and permits needed from local officials to perform backyard work. You may end up paying hefty penalties without the necessary paperwork. How will you use your backyard? Do you live with the elderly and kids? Do you have time to maintain your garden? When searching for a landscaper in Papillion, consider a company who can deal with complaints professionally. With our landscaper in Papillion, you get the benefit of working with someone who will not stop until you are happy with your yard. We are more than willing to correct any issues with our job or design until you are completely satisfied. A landscaper in Papillion cannot execute a project properly without using the right landscape tools. We use up-to-date design technology for landscapes. Having the right tools allows us to create and visualize the best plan for your yard. For our lawn care service, our landscaper in Papillion uses different equipment designed for specific projects. Our tools are also properly maintained to ensure that we can provide the best service to our clients. At Heroes Lawn and Landscape, we can turn your dream yard into a reality. Contact us today to schedule an appointment and work with the best local landscaper in Papillion. You may also visit our website at http://heroeslawnandlandscape.com/. Heroes Lawn and Landscape is a company that brings new meaning to the term, “full-service.” We are much more than just a landscaping company. Apart from landscape design, we also offer lawn care, lawn maintenance, mosquito control, and holiday lighting services in the Papillion community. The patch of land behind or in front of your Papillion home can serve a wide range of purposes. With our help, it can become an extension of your home or a showcase for your ornamental plants. We can turn a humble backyard in Papillion into an outdoor entertainment area by installing a custom-designed patio, and make hard-to-reach outdoor areas more accessible by constructing garden paths. By installing hardscapes such as retaining walls and steps, we can make your lawn or yard more functional and visually appealing in your local Papillion neighborhood. To meet the need for a one-stop business solution, these friends established Heroes Lawn and Landscape in 2014. From an idea among friends, our local company has grown to a full-service company serving Omaha, NE and surrounding areas. In 2016, we were awarded Thumbtack’s Best of 2016. Hire us and your backyard can become a pest-free oasis. We take great pride in our comprehensive mosquito and tick control strategy. Our team won’t just spray your backyard and call it done. We will actively monitor pest populations and weather conditions to adjust your treatment for the best possible results.